As data-driven marketers, we’re often in a rush to acquire more data. And when the flurry of that stage is over, we often continue trying to acquire more data rather than taking a step back to evaluate he data we’ve already collected. Often times, having a heap of messy disorganized data hinders more than it helps, and it’s important to put in the effort to consolidate. Imagine having gone through that consolidation and having clean data which fits perfectly in your marketing engine. For most marketers this would mean that their job goes smoothly without stress, but few can imagine this situation because the task of organizing a MarTech database can feel overwhelming, and it’s likely because we don’t know where to start. In this guide, we'll show you how to cleanse, build, and enrich your marketing and sales databases to deliver more effective campaigns, improve conversion, and help you close business faster. 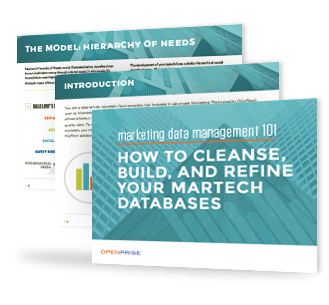 Fill out the form to download How to Cleanse, Build and Refine Your Martech Databases now.